In many countries, the law is required to apply a verification process before users can access the content of the website or if the website you are selling has products that are only suitable for certain ages. You want to limit it. With Mageplaza Age Verification extension, you will be able to confirm the age of your customers and grant access to the site only after age verification. And in particular, you can configure the content design for popup to validate the age to improve efficiency and fully capture customer information. Login to the Admin Magento, choose Stores> Configuration> Age Verification. Enable: Select “Yes” to turn on the Module. This is a required field. If you enter the letter, it will display an error message (only number allowed). Enable Term & Condition: Select Yes to turn on the display of Term & Condition notifications as a checkbox as I agree with the terms and conditions. Anchor URL: Enter the page link so that clicking on the name you just entered in the Anchor Text field will redirect to the page you want. Enter the number of days to save the cookie and apply this period for age verification. When the time runs out, the age verification applied for certain pages will be disabled then. Also, cookie will not save the data for underage verification. If left blank, default period is 365 days. 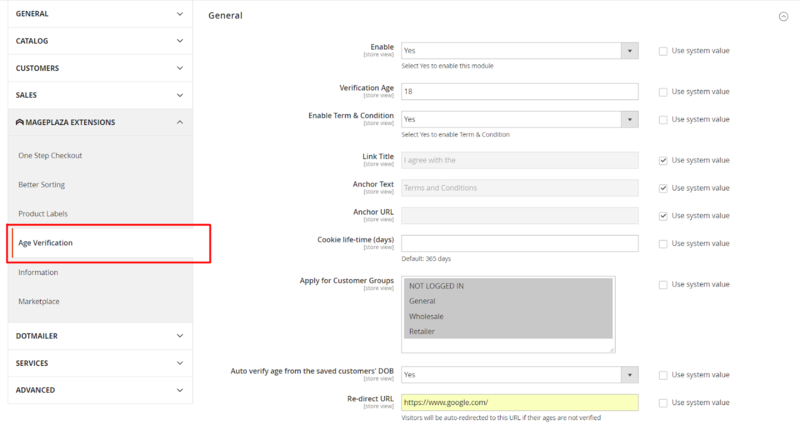 Auto Verify Age If customer has DOB: Select Yes to automatically verify age if the customer has a DOB when they logged in. If No is selected, it will display the popup to Age Verification even if the customer is logged in. For example: In case the customer has registered an account that has updated their date of birth and if the age is enough to access the website, it will automatically verify the age and vice versa if not old enough, it will automatically redirect to targeted pages you choose. Select the page you want to require Age Verification. You can choose to apply multiple pages at once. Sites not selected will not require Age Verification. Note: With checkout page including default checkout page and checkout page which are compatible with One Step Checkout, you can install One Step Checkout extension to make payment steps more convenient and faster. Select the CMS page you want to apply Age Verification. You can choose to apply multiple CMS pages at the same time. The CMS pages not selected will not require Age Verification. Select Category Pages to apply the Age Verification. 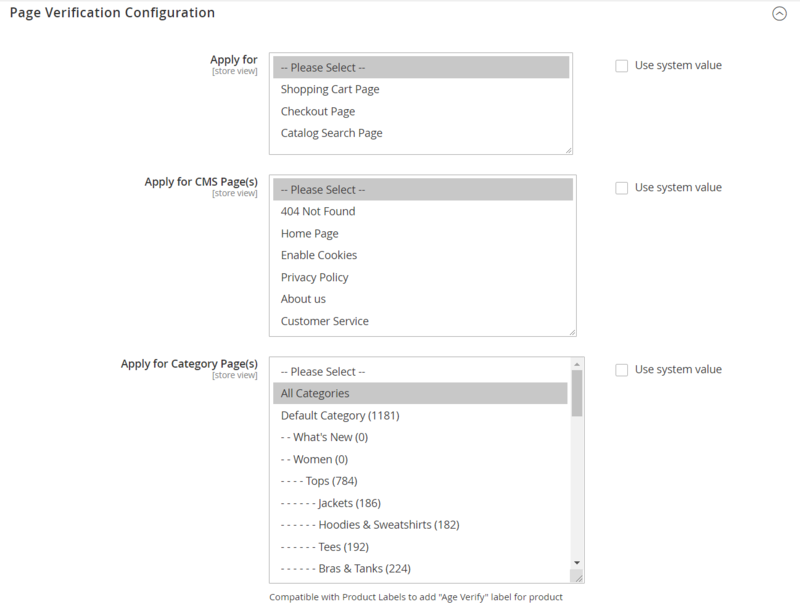 You can select all or multiple category pages at once. Non-selected category pages will not require Age Verification. Select Yes to show another field to apply Age Verification on the Product Detail Page. Those products that are satisfied will be applied to age verification. 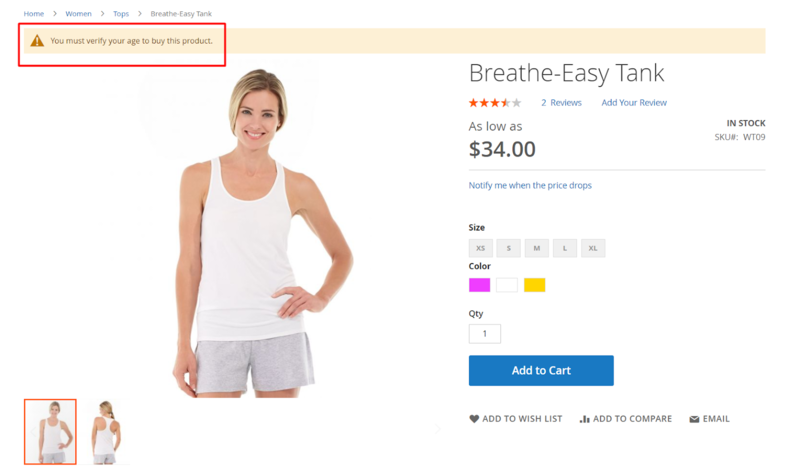 If this field is left blank, it will auto-apply age verification for all product detail pages. Select No: Not apply Popup of Age verification for any Product Detail Page. Enter the Url path which must be separated by a / in the field. Apply Age Verification with all pages except the url selected. Note: If the rule belongs to both Include Custom Page and Exclude Custom Page, then Age Verification will not be applied. If the Product condition belongs to both the Page Verify Configuration and Purchase Verify Configuration, it is preferable to consider the Product condition in the Purchase Verify Configuration first. 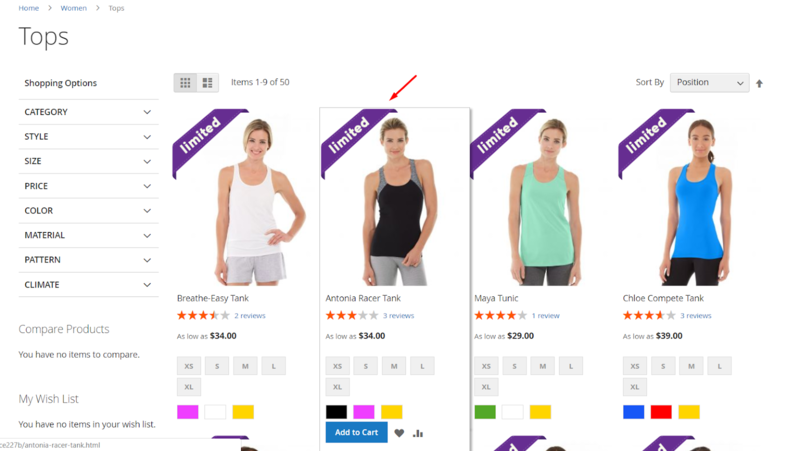 Small Image: Apply Purchase Verify Configuration with Small image. Show a Notice Image field. Notice Message: Apply the Purchase Verify Configuration to the Notice Message. Show a Notice Message field. Icon: click Choose file button to upload image. This icon is shown at the top of the popup. If left blank, the system will use the default image. Title: Enter popup name at the top. If left blank, the default name is AGE VERIFICATION. Description: Enter the popup description which is shown under the icon. 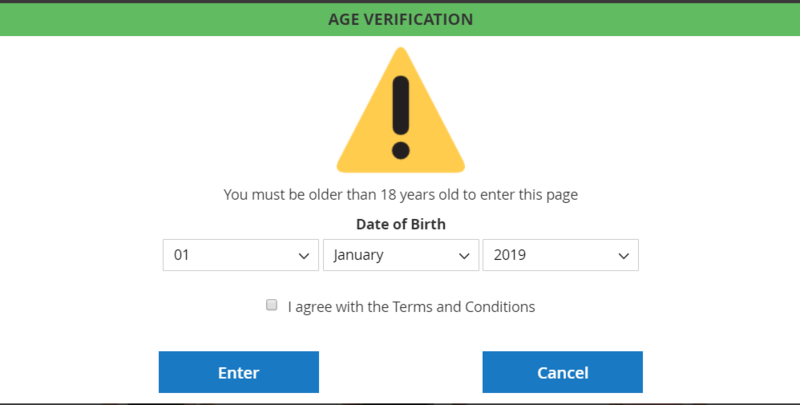 If left blank, it will default to the number of ages set at the Verification Age field, for example, You must be older than 18 years old to enter this page. Confirm button label: Enter the name of the button to Confirm the information added by visitors. If left blank, default label is Enter. 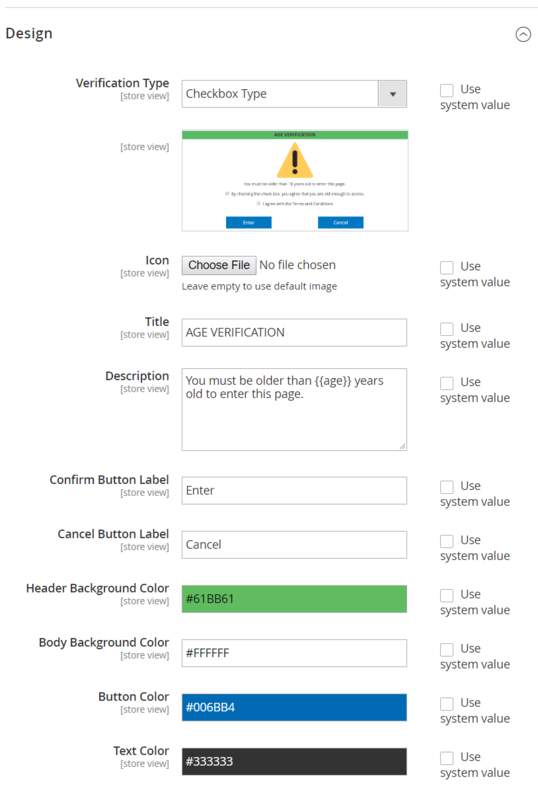 Cancel button label: Enter the button name for Cancel the age verification filling by visitors. If left blank, default label is Cancel. Header Background Color: Choose the color for Header Background on popup. 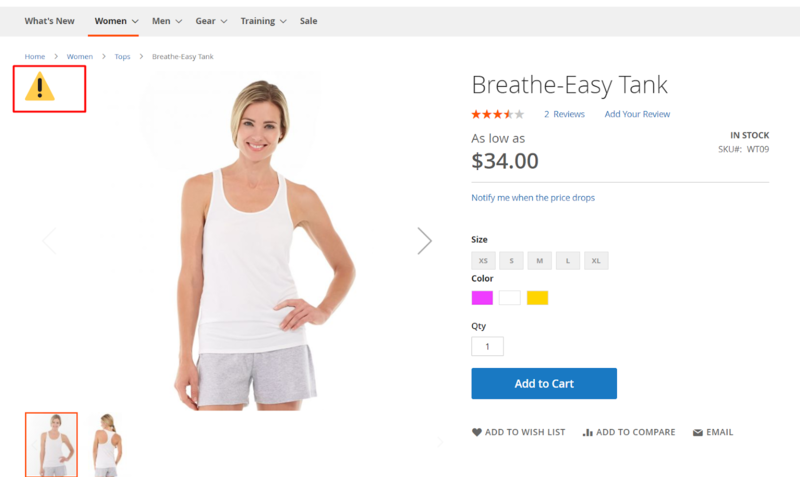 Body Background Color: Choose the color for Body Background on popup. Button Color: Choose the color for Button at popup. Text Color: Choose text color shown at popup.